The commissioning of sacred images in a church in one of the greatest art cities of Europe. A story of the vicissitudes of the Humiliati (Humbled Ones), a wealthy religious order who built substantial churches and monasteries in northern Italy. People may know their Church of Madonna dell’Orto, one of the masterpieces of late medieval architecture and Renaissance art in Venice. But their largest house was the Church of the Ognissanti in Florence, a building that imitated the preaching halls of the mendicants, where the Humiliati patronized some of the finest artists of their day. The authors examine the Ognissanti artwork in its architectural context and seek to bring out themes that reflect the charisms of the order. 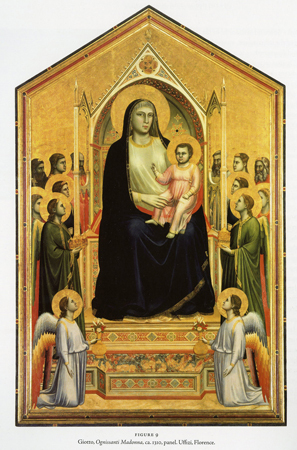 So for instance, the Ognissanti Madonna by Giotto (ca. 1310), which the authors convincingly argue was originally on the high altar, portrays her wearing a white tunic associated with the light grey Humiliati habit and with a pose emphasizing charity. Giotto’s crucifix, probably originally above the choir screen (now in the Gucci chapel), and his triangular Dormition emphasize the corporeality of Christ and His mother. Because the Humiliati did not have prominent founders and only one saint, the apocryphal Giovanni da Meda, they took on many of the practices of the mendicants—especially the Dominicans (although the Humiliati did not beg)—and borrowed some mendicant themes and artists. This lack of saints also led to the order’s adoption of Saints Benedict and Bernard as quasi founders, who were portrayed, along with Saint Augustine, in many altarpieces. “Bernard’s extensive writings on humility, particularly that of Mary, may have affected the decision to emphasize her humility in these images” appropriate to an order named Humiliati. Fifty years after Giotto’s high altarpiece, Giovanni da Milano’s polyptych (a composition more favored by the mendicants) replaced it. This image, which has been reconstructed in the book, had a Coronation of the Virgin flanked by six choruses: Virginum Martyrum, Martyrum, Apostolorum, Patriarchum, Confessorum, and Prophetarum. The patron may have been the wealthy Luca Manzuoli, a member of the community who became Bishop of Fiesole and a cardinal, and who was later beatified and is buried in the church. Among the other masterpieces commissioned by the Humiliati, with presumably some assistance from lay patrons, is the reliquary bust of Saint Rossore by Donatello (ca. 1425). Having a side altar and relics of this saint on whose feast day the Florentines won the Battle of San Romano encouraged devotion at the church. Along the side of the nave, in the Amerigo Vespucci chapel, Domenico Ghirlandaio painted a fresco of the Madonna of Mercy above the Lamentation of Christ in 1475. The theme of charity relates the Virgin’s intercession to Christ’s sacrifice and may reflect the patron’s support for the hospital of the Madonna dell’Umiltà nearby. It is believed that the Vespuccis also commissioned Ghirlandaio and Botticelli to paint frescoes of Saint Jerome and Saint Augustine (scholar saints and friends) on the choir screen. Botticelli’s tomb can be found in the floor of the chapel of Simone Vespucci. Ghirlandaio also painted a Last Supper in the refectory, the first Last Supper painting in a refectory not to have narrative scenes above (c.f. Santa Croce, Sant’Apollonia, Foglino, Passignano). As the Humiliati declined in numbers and respect (from 4,000 professed members in 1298 to 170 members in 1571), they continued to commission art, though on a smaller level. A terra-cotta lunette over the front doors, depicting the Coronation of the Virgin with saints, references the dedication of the church to All Saints as well as the high altarpiece inside. Ridolfo Ghirlandaio’s fresco of the Trinity and Coronation in 1530 offers a nice comparison with his father’s fresco directly across the nave. In 1527 the Humiliati were expelled from Santa Cecilia in Rome for lack of monastic piety, and one of their own, Mario Pizzo, wrote of his fellow Humiliati’s sacrilegious behavior (including gluttony and lust), predicting the end. Pope Paul IV wrote that the Humiliati “non erano umiliati ma umiliandi” (were not humbled but humiliating). The Humiliati were sent from their churches by more vibrant orders, including at the Ognissanti, where the Observant Franciscans took over in 1561. The final blow came in 1569 when a Humiliati brother attempted to assassinate Carlo Borromeo in the hope of stopping the pope’s reform of the order. Borromeo survived the gunshot, much like another saintly Karol of recent times, and forgave the Humiliati conspirators—but Pope Pius V suppressed the male branch of the order. Not surprisingly, much of their art was covered over or taken out of the Ognissanti, later ending up at the Uffizi. This fine book attempts to reconstruct the locations of the art before the Franciscans renovated, though an actual plan of the church before 1561 would have been beneficial. In an interesting development, later some of the ex-Humiliati churches commissioned altarpieces or reliquaries in honor of the one who had attempted to reform and preserve the order, San Carlo Borromeo.